Air Force Capt. 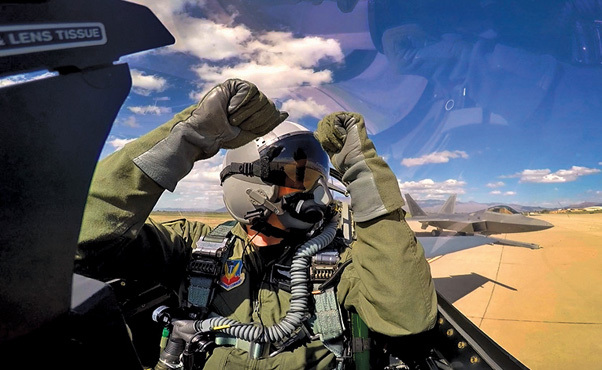 Craig Baker, F-16 Viper Demo Team pilot, signals to an F-22 Raptor before take-off at the Heritage Flight Certification and Training Course at Davis-Monthan Air Force Base, Feb. 27. During the four day course, Baker flew eight sorties, practicing his demonstration and learned to fly Heritage Flights with Several HF aircraft. SHAW AIR FORCE BASE, S.C. — An F-16CM Fighting Falcon shoots into the air, flying at a speed of 400 knots as it is pulled through various maneuvers to demonstrate its capabilities. Maneuvering the aircraft through inversions, undergoing eight to nine times the force of gravity, and pushing the F-16 to its limits is Capt. Craig “Rocket” Baker, Viper Demo Team pilot. From a young age, the Air Force Academy alumni had an itch for the thrill to fly. “It’s what I always wanted to do and I’ve been fortunate enough along the way to have family from when I was a kid all the way through my Air Force career, support me along the way to allow what was a dream to become a reality,” said Baker. Through the years, Baker, a Gray’s Creek, North Carolina native, sought out the best way to become a pilot in the world’s greatest Air Force. Going to the Academy was fueled a lot by the desire to become a pilot, but it quickly became about being patriotic and serving the country, said Baker. 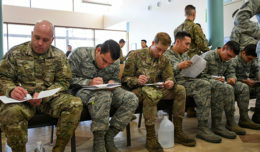 Baker, the first in his family to join the military, went through three years of vigorous training to become an Air Force pilot including pilot training to obtain his wings, land and combat survival training, the Introduction to Fighter Fundamentals course, and the F-16 Basic Course. During training pilots are able to list by preference which aircraft they would like to fly, and for Baker it was an easy choice. 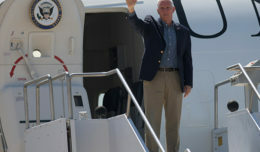 His top choice, which was also the seat he received, was the F-16 because it is a single seat, single engine, multi-role aircraft that engages in air-to-air and air-to-ground missions and flying that aircraft is highly esteemed in the Air Force. 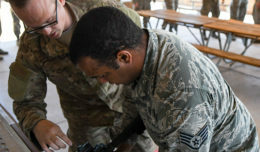 The Team Shaw pilot, regularly assigned to 79th Fighter Squadron, has been assigned to Shaw Air Force Base, South Carolina, for two years and deployed twice prior to his selection for the Viper Demo Team. Demo pilot’s hearts typically drop approximately four inches while flying aerobatics and because of how Baker sits in the cockpit, the will blood pool in his elbows and his neck will hurt since it is not made to support a head that weighs nine times heavier than it normally does. To physically prepare for the aerobatics, Baker began participating in triathlons and consistently works out four to five times a week. Baker, the Viper Demo Team “Rocket”, pierces through the skies, not only to do what he loves, but also to fulfill his ambition to support the Air Force by demonstrating to the world what the greatest Air Force is capable of.